What are the steps to organic certification? If you are interested in obtaining IOA Organic Certification for one or more food or feed products then please contact IOA on 090 64 33680 or email info@irishoa.ie to talk through the process with a member of our friendly team, who will send you a standards/information pack. These packs include all you need to apply to the Irish Organic Association. When you are ready to apply, send us your completed application form, product details, draft product labels, HACCP summary, ORG1 form and payment for certification. Please call us on 090 64 33680 or email info@irishoa.ie if you have any questions about filling in the form. Once we have received and reviewed your application, an inspector will contact you directly to arrange a convenient time and date to inspect your premises. The inspector will assess the premises, products, processes and records systems for compliance with the IOA Standards. The inspection will incorporate, for example, a review of the procedures in place to ensure adequate segregation between organic and non-organic food (if applicable), traceability measures and a full site visit. If there are recommendations arising from the inspection you will be issued with them in writing on the day with instructions on how and when to respond. The inspector will forward the inspection report form and summary to IOA. Our Certification team will review your inspection report and, where applicable, your responses to the recommendations. If everything is in order, your file will be submitted to the Certification Panel for review. Following the Certification Panel meeting we will issue your first licence/trading schedule which will allow you to market and sell your organic products. 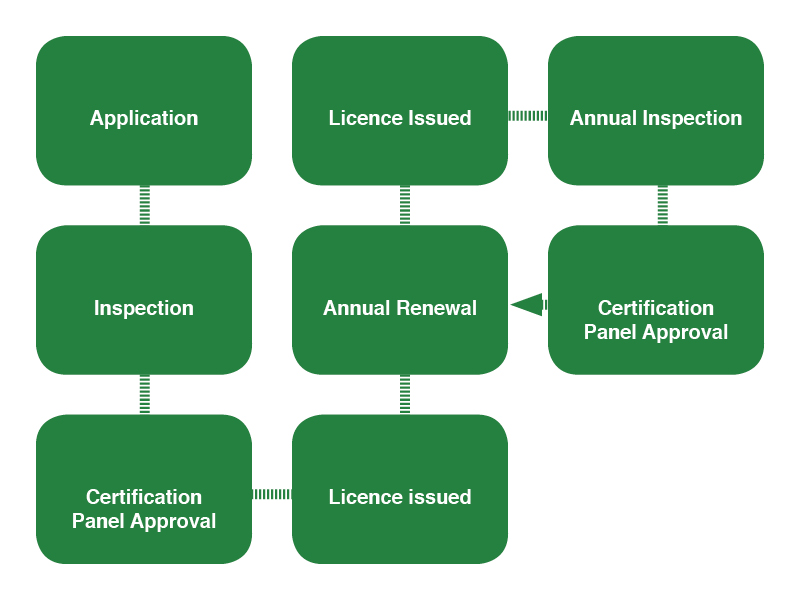 Each year your organic licence will need to be renewed. IOA issue Annual Renewal Forms at the end of the year for renewal of the licence. These forms need to be completed and returned to IOA with the annual renewal fee. IOA will need to inspect your premises every year. You will be directly contacted by your inspector to arrange a convenient date. In addition you may be subject to an unannounced inspection and/or product sampling. We aim to make the process of certification as straightforward as possible, please allow 6-8 weeks from your date of application to the completion of the process. More information about the certification process and our procedures is available on request, so please get in touch if you would like to find out more.